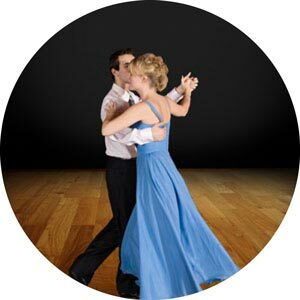 Learn how to dance the popular ballroom dance, The Quickstep at the Rockin Horse Dance Barn. The Quickstep evolved in the 1920s from a combination of the Foxtrot, The Chase G Chug, Charleston, Shag, Peabody, and One-Step. The dance is English in origin, and was standardized in 1927. While it evolved from the Foxtrot, the Quickstep now is quite separate. Unlike the modern Foxtrot, the man often closes his feet and syncopated steps are regular occurrences (as was the case in early Foxtrot). Three characteristic dance figures of the Quickstep are the chassés, where the feet are brought together, the quarter turns, and the lock step. This dance gradually evolved into a very dynamic one with a lot of movement on the dance floor, with many advanced patterns including hops, runs, quick steps with a lot of momentum, and rotation. The tempo of Quickstep dance is rather brisk as it was developed to ragtime era jazz music which is fast-paced when compared to other dance music. By the end of the 20th century the complexity of Quickstep as done by advanced dancers had increased, due to the extensive use of syncopated steps with eighth note durations. While in older times quickstep patterns were counted with “quick” (one beat) and “slow” (two beats) steps, many advanced patterns today are cued with split beats, such as “quick-and-quick-and-quick, quick, slow”, with there being further steps on the ‘and’s.